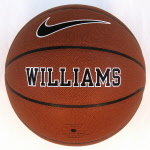 Fullsize men's Nike® basketball with embossed Williams in silver and black. Synthetic leather. Fullsize men's Nike® football with embossed Williams in silver and black. Synthetic leather. Official size & weight hockey puck with Williams Hockey and cow mascot design. 9" foam cow spots football with big W and Williams. 6" foam purple & gold football with Williams and cow mascot.